I own a gifted Pandora bracelet and charms and is very much happy with it. But on the last day of February, I knew that my bracelet would not be limited to Pandora charms only, because I saw this (post from marthnickbeads) -limited edition, bead of the month from Ohm beads. It was the Bunny Angel. It was really cute and a fitting memorial for my beloved bunnies. Instinctively, I went to order one for myself hoping that I could still get one as Ohm bead’s limited ones tend to sell out fast! They are only making 2222 of these charms and I have to wait for their release day that was on March 2 to order. I just placed an order and waited. Exactly Easter Sunday I get a message that the my bunny angel is now in the Philippines! Of course I had to wait a few more days for it to arrive home. 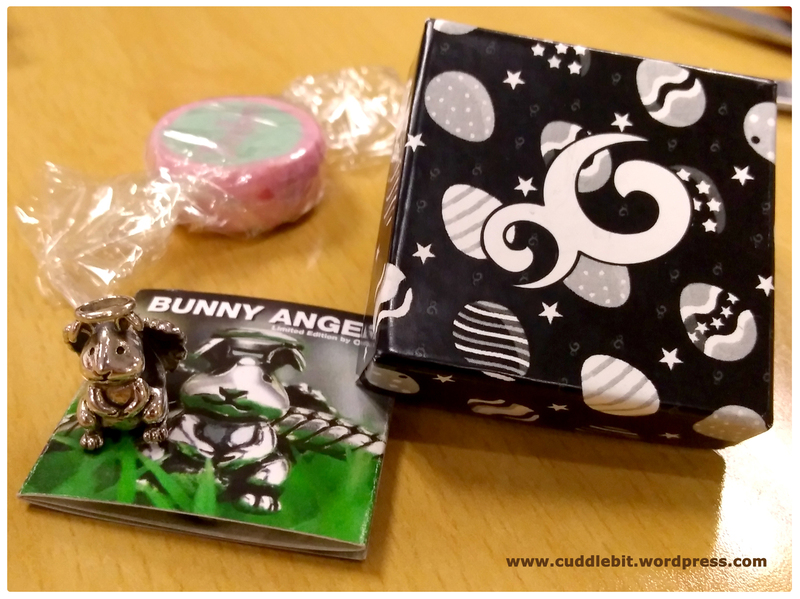 I got bunny angel with the serial#DJP879/2222 from Denmark that went to Australia and finally to Philippines – This bunny sure traveled quite a distance to get here. And it came with a Perlen candy in tow along with a certificate of authenticity that bears the serial number. True to their promise the Ohm bead fits in my Pandora bracelet with quite a lot of room to spare. I do notice that the Ohm bead is quite lighter in weight than a Pandora charm. It does however have a lot of detail (Just look at those beautiful wings and he also has a cute little halo to match!) than that of Pandora’s charms. I am also impressed that the bunny angel is serialized and engraved with an individual code. That attention to detail is just amazing. Not bad for my first Ohm bead. It was well worth the wait. *All my reviews, opinions, and other stuff expressed here are my own and based on my own experience with the product. This is not a sponsored post, I paid for this from my own pocket. Categories: animals | Tags: bead of the month, bunny angel, charm, limited edition, ohm, ohm beads, Pandora, Philippines | Permalink. What a sweet memorial to your bunnies. Glad you like it!